The centrepiece of a magnificent 8-sided square first laid out in 1699 to show off an equestrian statue of the Sun King, Louis XIV. The centrepiece of a magnificent 8-sided square first laid out in 1699 to show off an equestrian statue of the Sun King, Louis XIV. 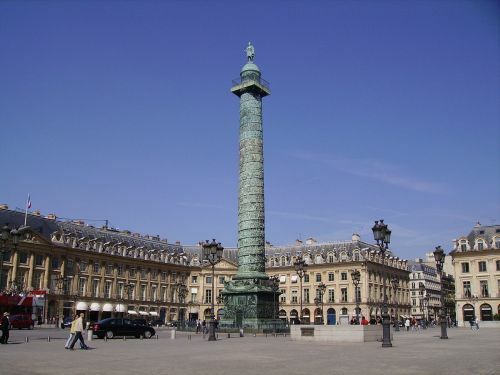 The statue was removed amidst Revolutionary fervor in 1792 and replaced in 1806 with the Colonne de la Grande Armée. This was modeled on Trajan's column in Rome and decorated with Napoleon's military exploits. The present column is a replica, however, as the original was pulled down during the 1871 Paris Commune. Place Vendôme represents the best of well-heeled Paris, being home to an abundance of exclusive boutiques, jewelers and fashion labels - Cartier, Boucheron, Trussardi, van Cleef & Arpels - several banks, the French Ministry of Justice and the Ritz Hotel.